How to get past "the wall". the point where you reach a certain amount of speed and accuracy but than the progression just stops. I'm a teacher. I'm already doing this on my own (including sharing a CTC video in class) but I would like to see a primer for beginners so they can be aware of picking mechanics from the beginning. Hopefully, this would help players avoid bad habits and make progress more quickly. I'm a beginning guitarist what do you recommend for practice or is it to early for me to start whit pick slanting? I am able to read and vote on questions. But how come I can’t hear the live session? I’ve tried both Firefox on windows 10 and safari on iOS, with no luck. Do you think there is a big difference in tone depending on which motion mechanic is being used...for instance, wrist or elbow? Do you think someone could hear the difference without looking? I broke a speed wall of years by trying to go for the fastest I could but withouth thinking in rythm figures, without a metronome... opposed to what I always have done of using one for speed progress... Do you think tha metronomeless practise helps mechanics in a different way? Do you think pick thickness and tip shape matters when it comes to playing fast, or do you think that thickness and tip shape is more of a tonal consideration? Is there really minimum amount of edge picking needed to achieve speed, fluency and dynamic control. Can some elbow/shoulder movement help with forearm rotation DWPS? Is there any "grand unified motion" that could work for both 2 way pick slanting and crosspicking, so that the motion you use to change your pick slant is the same one that you use for crosspicking/1NPS lines? That seems like the Holy Grail for alternate picking. One technique that lets you do everything. Martin Miller seems to get close, but he still has 2 "modes" and he switches back and forth. Have you ever found motor interference being an issue when learning all these different movements? It seems that I use different movements for UWPS and DWPS so when practicing TWPS there is always a delay that takes place while switching mechanics. Which is more important: hard work, or stick-to-it-iveness? Does Swiping tend to favor elbow technique for picking? The subject of the broadcast flows from things we’ve been learning on our new forum, and one of the most important of these is: picking motion mechanics. More specifically, the difficulties that players face in developing it. What’s so hard about moving a guitar pick back and forth, even on a single string? Well, for one thing, there are so many ways to do it. Wrist movement might be second nature to you, while elbow movement might feel more natural to another player. And both of these are oversimplifications, because there are many variations of each. Factor in anchoring, muting, string switching, string tracking, fretting hand synchronization and other variables, the number of combinations quickly gets… out of hand. So in this Talking the Code help session, we’re going to take a practical look at some of the most common picking motions in popular use: wrist, elbow, and forearm. We’ll look at how these movements work in both downward and upward pickslanting orientations. We’ll examine their anchoring and muting approaches and interaction with common pick grips. 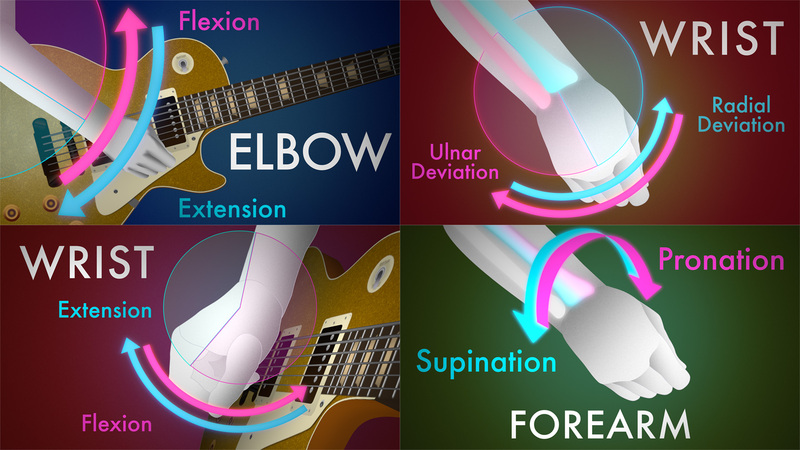 We’ll cover the anatomical basics of arm and wrist movement, how to identify basic categories of picking and pickslanting movements. When we’re done, you’ll be able make a pretty solid educated guess about the pickslanting techniques a player is using just by observing the way that player holds and contacts the guitar — even if you can’t see what the pick is doing up close. And even if that player is you! If you’ve struggled to find a picking motion that’s comfortable, fast, and effective, or if you just enjoy these kinds of subject, this should be a fun introduction to this fundamental yet deceptively complex topic. And don’t worry if you can’t make the broadcast. Recordings of this and future broadcasts will be hosted on the platform for subscribers to watch or re-watch when they want. Not only that, all the questions asked and answered through the new interface will be available in the interactive timeline beneath the platform version of the video, for easy navigation. This aspect of the broadcast setup is one we’re excited about: making everything we do findable in an organized way, so that it’s available for learning.